As the second arc of 'Copperhead' comes to a close the fate of a kidnapped Boo is revealed and a new mystery begins. Sheriff Bronson and her posse are in the middle of a criminally run citadel called the Bastion trying to stay incognito while searching for Boo and his captors. The story takes some surprising turns and the art continues to impress. Before writer Jay Faerber and artists Scott Godlewski and Ron Riley take a break ahead of the next arc this one comes to a ferocious end. Boo's captors really hadn't thought this plan through and it shows in their indiciveness and lack of forethought. Yet, they know they can't keep Boo alive in such a haven of criminals risking their own lives in the process. It's up to Bronson, Ismael and even Cletus to use their wits to get to Boo before it's too late. The plot may seem a bit formulaic but Faerber's strengths carry the series with great dialogue, pacing and action. 'Copperhead' has been more about the journey than the destination. At times a great police procedural and at other moments a great sci-fi western. Seeing the development of Bronson in particular has been exciting to witness. She's slowly opening up and being less stoic and hard-nosed and becoming more relatable to the other characters. Even to Boo...sometimes. That's not to say she's any less of a badass or one hell of a cop. Her ingenuity and bravery comes through in spades once again. The tidbits about her past we've been privy to will no doubt come into play going into the next arc. The team of Scott Godlewski and colorist Ron Riley have made 'Copperhead' one of the best looking books available. There's no drop off in issue ten. Godlewski's sharp lines and imaginative character designs has opened up a unique world of creatures and artificial beings. Riley isn't afraid to use every color at his disposal. This isn't some dark and gloomy vision of some post-apocalyptic universe. It's as bright and bold as a sunny day in the west. 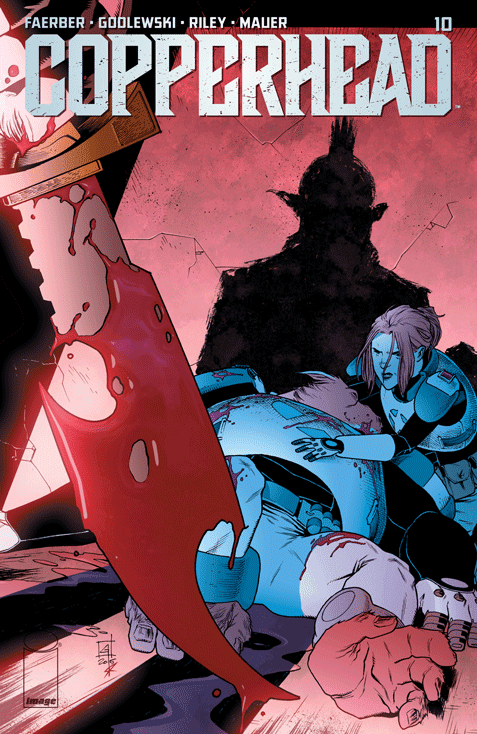 'Copperhead' #10 brings the second arc to a satisfying end and sets the stage for a revealing third. Clara Bronson remains under the radar as one the most complex female characters in comics. Faerber continues to peel back the layers with more to come. Grab the trades as fast as you can.